jb0784-9 has no other items for sale. Details about Antique scarce aqua mint~Baltimore Glass Works // Resurgam ~Pint Flask,7 3/4 in. Antique scarce aqua mint~Baltimore Glass Works // Resurgam ~Pint Flask,7 3/4 in. 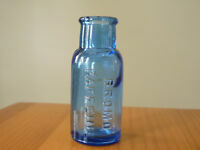 Antique Strap Side Glass Bottle "Warranted Flask"